American writer, actor, and director John Cameron Mitchell is best known for Hedwig and the Angry Inch 2001 an award-winning musical about an East German transgender rock musician chasing after an ex-lover who stole her songs and the 2006 film Shortbus an explicit sexual movie about the lives of several characters living in present day New York. Both films pushed sexual limits and broke genre boundaries. 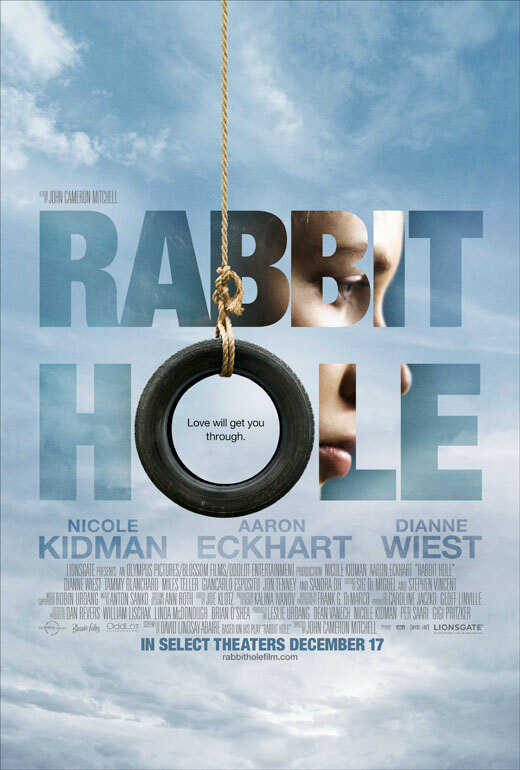 Rabbit Hole 2010, a drama he filmed primarily in suburb of the borough of Queens, New York City, marks a major progression for Mitchell. Pulitzer Prize winning play writer David Lindsay-Abaire from his 2005 play of the same name adapted the screenplay. The plot deals with a middle class couple, Becca and Howie Corbett who are struggling to cope with the untimely death of their 4 year-old son Danny who was accidently run over and killed eight months previously when he run into the road outside his garden gate after his dog. Becca, attempting to cope in isolation, is cold, withdrawn and inconsolable rejecting any form of support or help, turning her back on the self help group she was attending with her husband and forcing him to look elsewhere for comfort. Finding acceptance only after she forms an unconventional bond with Jason, a teenager who was the unwitting instrument of the child’s death. The film stars Nicole Kidman as Becca Corbett, Aaron Eckhart as her husband with Dianne Wiest as her mother and relative newcomer Miles Teller in his first feature film as Jason. This brave, honest film has few direct comparisons; primarily at the its heart is the grief over the death of a child that in similar films is not always dealt with head on. It has been proved that even after many years, parents grieving the death of a young child can still suffer from deep bouts of depression, experience divorce and have an above average death rate, I think this courageous film demonstrates the heartache and misery attached to such an emotive subject. The award winning actress Nicole Kidman. Ms Kidman produced the project via her company, Blossom Films and it premiered at the 2010 Toronto International Film Festival in September of that year. Dianne Wiest, who has won two Academy Awards for Best Supporting Actress including 1986 Hannah and Her Sisters and Bullets over Broadway (1994), gives a performance to match the best of her work. Eckhart, who you may know from Thank You For Not Smoking (2006) and as Two Face in The Dark Knight (2008) is superb as a husband tortured by both the death of his son and his declining marriage. Nicole Kidman was critically acclaimed for her remarkable performance as Becca Corbett. I quote “We expect disciplined, precise work from her, but there is new range here, with a willingness to show frayed emotions that make this one of the finest performances of her career” (for which) she received an Academy Award nomination for Best Actress. The 43 year-old actress had two previous nominations for an Academy Award, becoming the first Australian to win Best Actress for her portrayal of Virginia Woolf in The Hours (2002) a role that also brought her a BAFTA and a Golden Globe. Just a wee footnote: due to a scheduling conflict, Nicole declined a role in Woody Allen's latest release You Will Meet a Tall Dark Stranger, in favour of this film, in hindsight a very good decision.